ww2dbaseGünther Prien was born in Osterfeld, Saxony, Germany. After years of experience at sea, he joined the Reichsmarine in 1933 and served aboard the light cruiser Königsberg. In Oct 1935, he was transferred to a submarine. On 17 Dec 1938, he was given commission of U-47, a Type VIIB submarine with a promotion to the rank of lieutenant. On 14 Oct 1939, at the very beginning of the Battle of the Atlantic, Prien skillfully navigated U-47 in shallow water, around three sunken ships in the Holm Sound, and entered Royal Navy's base at Scapa Flow. After firing two spreads of torpedoes (the first salvo missed entirely), he sank the battleship Royal Oak that lay four thousand yards in front of him. He noted in his logs "There is a loud explosion, roar and rumbling. Then come columns of water, followed by columns of fire, and splinters fly through the air." After an equally stunning escape from Scapa Flow after the attack, he was awarded the Knight's Cross of the Iron Cross and instantly became a national hero. In 1940, he earned Oak Leaves to the Knight's Cross. He was killed in 1941 when U-47 was either attacked and destroyed by British destroyer Wolverine or of another reason. He was responsible for sinking 30 Allied vessels totaling 164,953 tons. 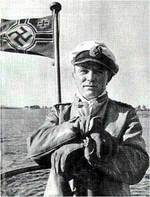 Historian William Manchester called Prien Admiral Dönitz's "best U-boat Kapitän." 16 Jan 1908 Günther Prien was born in Osterfeld, Sachsen, Prussia. 7 Mar 1941 Günther Prien passed away. He gained the nickname Der Stier von Scapa Flow ("The Bull of Scapa Flow").